Linda O’Neill – unusual start! I used to work as a Digital Painter for Lucasfilm on motion pictures and commercials, painting color and texture on creatures and objects. I loved doing that but my real passion was to get back to painting on canvas which is what I studied in college. I have loved to draw and paint as far back as I can remember. I discovered art at an early age and eventually went on to receive a Bachelor of Fine Arts in 1993. I still occasionally rummage through a box of my childhood creations and enjoy the freedom and expression of that younger self. Many years ago, I did a digital painting that depicted a person experiencing a migraine. I have suffered from migraines most of my life so this was very personal for me. It won an award from the National Headache Foundation of Chicago. 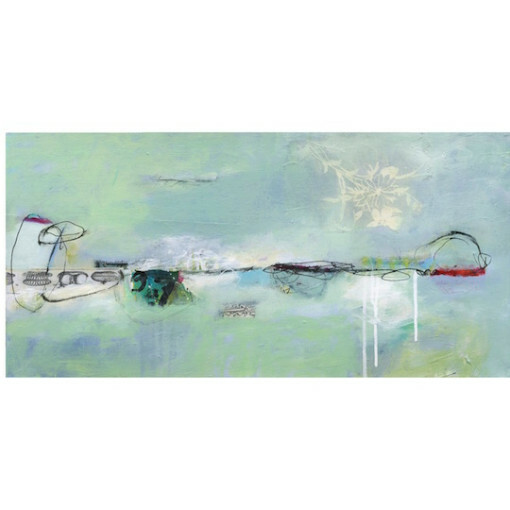 Over the years, I have been influenced by contemporary artists such as Richard Diebenkorn, Nathan Olivera, Franz Klein, Joan Mitchell, Jean-Michel Basquiat and Cy Twombly to name a few. 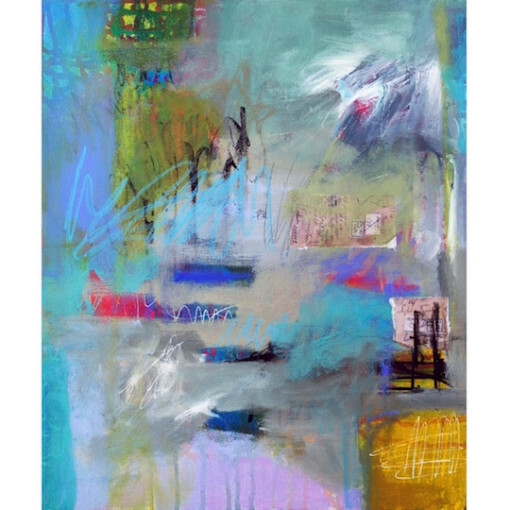 I am an abstract expressionist and work very intuitively using color, text and collage to expose what is raw and authentic for me emotionally. I paint with acrylics on both canvas and paper, working layer upon layer, always listening to music. I often rotate the canvas as I go until I’m happy with the progression. I make a point to let go of critical thinking, preferring to let my subconscious run the paintbrush. Before I focused soley on abstracts, I used to paint both animals and still life. One of the first paintings I sold was a commission of a dog. I absolutely love dogs so painting them came naturally for me. In fact, Abby Creek Studios is named after my first beloved dog, Abby. I usually work on at least 4 paintings at the same time. 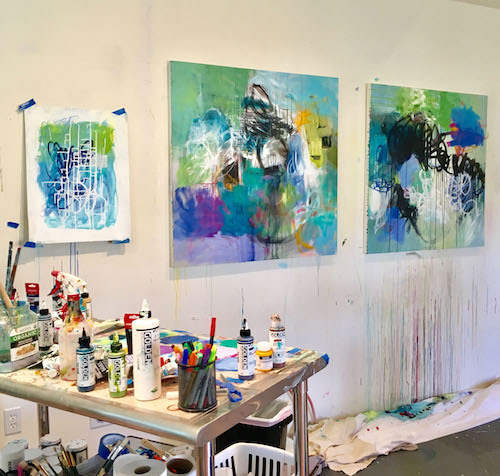 I find that switching back and forth keeps my energy going and my ideas develop and expand as I move from one canvas to another. It’s almost as if each canvas is talking to the other. 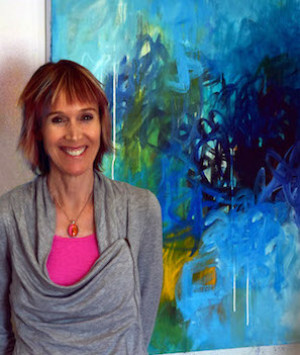 My paintings refect a desire to have a voice in the world when finding words to express myself doesn’t always come easy. I am constantly searching for the “lightness of being”…the ability to overcome fear and pain and transcend to a better place. Light vs darkness, fulfllment vs loss, tranquility vs anger are all essential elements in my work. My husband and I moved to Colorado from Northern California in 1997. We love Boulder and feel so happy and lucky to live here. I spend my creative work days in a studio adjacent to my home. The incredible colors, light and textures of the landscape here always inspire me and influence my work. We love to travel and hike in the mountains with our Dutch Shepherd, Maisie. “Light vs darkness, fulfillment vs loss, tranquility vs anger are all essential elements in my work.